What a sweet, sweet memory! To me ,this is what food is all about! I couldn’t agree more. These are the moments and memories that stay with us. Oh wow, I almost forgot about this!!! Thanks for letting me guest here and what a nice write up. I’m so glad we met at BSP – another great food memory for the ages!!! Jennifer, I’m thrilled that the Universe got us together at BSP…and that you allowed me to share this Food Memory. Wendi, thanks for turning me onto Jennifer’s blog. She’s a riot and it shows in this food memory. And now, I’ll always remember to trim the crap off. Ali, wasn’t the whole stream of consciousness aspect of his recipe a riot? Not the easiest thing to work from but still quite entertaining. “I really love cheese and bacon.” Me too, honey, me too. I totally made out with a bacon, egg and cheese bagel at breakfast yesterday. And Wendipants, I made my bacon in the oven on a parchment lined baking sheet. It was glorious because 1) I didn’t have to wipe down the stove, 2) I didn’t have to wash a dish and 3) I didn’t ruin another shirt with hot jumping grease! Brooke, I’m convinced that part of my requirements for being “good people” includes an unadulterated love of cheese and bacon. Welcome to the world of oven cooked bacon my friend. It may prove to be our downfall, but at least we’ll be undone by gloriously cooked pork product. What a great write up, very cute! Delishhh, this is what I love about Food Memories. My thanks to Jennifer for letting me share hers. I heart chicken pot pie. But not so much canned gravy and piecrust. But I enjoyed the memory all the same! I loved his effort but am glad that Jennifer has moved him away from the canned gravy and frozen veg. So, we drank it out of regular glasses but in retrospect, who was I to judge? It was white zinfandel. any man who attempts to cook at all is a fine man. so very glad she snagged him, he sounds like a keeper. Lan, there’s so much to love about this Food Memory. Heh. I was 25 at the time. I thought the white zin was sophisticated. And he’s totally a keeper. How many times did you have to try the broccoli before you liked it? I’m wondering if your experience backs up the try-a-food-10-times-to-like-it theory. And I think it’s nice that you’re future husband made chicken pot pie for you on the first date, even if he didn’t make every piece of the pie. It sounds delicious either way! Seems like I should remember this food memory (I’m Jen’s sister) but I don’t. Did you tell this story? The recipe is wicked funny and definitely fitting of Mr. B&P! Karma, I hope that Mr. B&P has honed his kitchen skills with Jennifer’s help. 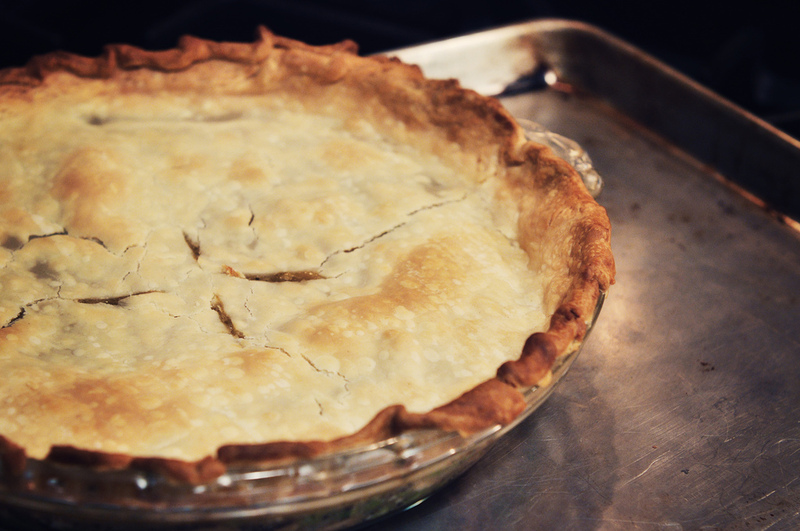 Because this pot pie may have been endearing on the first date but not after years of marriage. Honestly, Mr B&P has become so spoiled that he has left the kitchen all together and has probably lost most kitchen skills he ever had. How sweet a story! and to be connected to comfort food at that! I haven’t been eating must have some kind of bug or something. I wound up in the ER friday night with nausea and my spouse would not leave. he slept on the floor of my cubicle until 8am when i was admitted! this kind of devotion is rare but I see it in her spouse. will try this recipe as soon as they let me have real food again! Emily, I hate being alone in the hospital. Big bonus points to your husband for staying with you. Get well soon so you can try this humble comfort food. Holy hubcaps, YUM! This is a gorgeous food memory. 🙂 LOL … Broccoli is gross, I used to stuff the stuff behind my dad’s SUPER expensive recliner chair, hehe, he wasn’t to happy when he found it. Anna, it sounds like you haven’t made your peace with broccoli. And that’s ok. Bonus points for your creative use of furniture to dispose of vegetables.